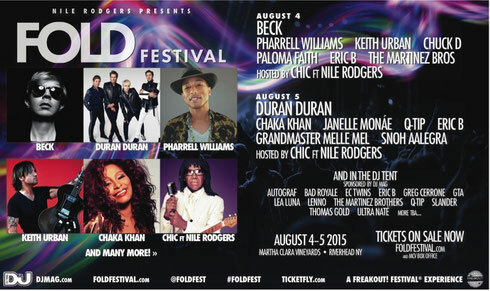 DJ Magazine recently announced that it will partner with the Fold Festival at the Martha Clara Vineyards in Riverhead, NY on 4 & 5 August 2015. The two day music festival is being produced and hosted by Grammy-winning composer, producer, arranger and guitarist, Nile Rodgers and is an event that will feature Rodgers and his multi-platinum band Chic sharing the stage with music legends and contemporary artists. A special part of this two-day event will be the onsite DJ Magazine “DJ Tent” that will host artists including Autograf, Bad Royale, Cevin Fisher, EC Twins, Eric B, Greg Cerrone, GTA, Lea Luna, Lenno, Q-Tip, Slander, Thomas Gold, The Martinez Brothers and Ultra Naté. “If you don’t like dancing to a variety of high quality music with the gorgeous Hamptons as backdrop, then go back to your backyard barbeque and test Pandora’s Nile Rodgers channel—as if that encompasses the unique nature of this first-ever gathering. I am honoured to partner DJ Mag with FOLD Festival. We at DJ Mag live and breathe dance music… and Nile is our oxygen.” Sarah Polonsky, Editor-in-Chief, DJ Mag USA. “The first day I walked into a disco and heard a DJ play Donna Summer with two turntables, my life forever changed. The quality DJs we have playing FOLD, will change another life too!" Nile Rodgers. In addition to the DJ Tent performances, The Fold Festival will also feature sets from the likes of Beck, Pharrell Williams, Keith Urban and Chuck D (4 August) and Duran Duran, Chaka Khan, Janelle Monáe and Q-Tip (5 August), among others. Check www.foldfestival.com for more info.